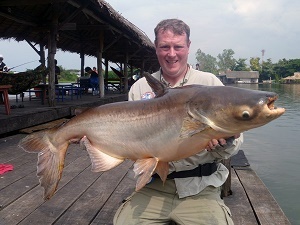 The following is Eric’s account in his own words detailing his first introduction to the awesome Mekong Catfish whilst fishing in Thailand at Bungsamran Lake in Bangkok. There were fish everywhere when I turned up and fishing from the public area my guide put us right int he middle of them. Very quickly I was into a fish which was lost when it got under the staging and wrapped itself around the posts. I didn’t have to wait too long for the next fish and I quickly had an 18Kg fish in the net. The action was relentless all day with the majority of the fish being 20kilo+ with the occasional 30 kilo fish and topped off with one of 40kg. I also had a bait out for Siamese carp which could be seen leaping during with the day along with armoured backs of arapaima. Unfortunately no carp came our way but late in the day the line started to trickle from the spool and the result was a 9kg stripped catfish .